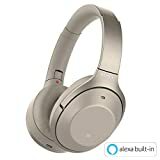 The incredible Sony WH1000XM2 Wireless Noise Cancelling Headphones everyone loves so much are available at a discount pretty regularly these days if you’re willing to buy them refurbished. Considering how great they are and how expensive they are at $350 though, refurbs are well worth it. Today, however, our readers have a rare opportunity to save big on brand new WH1000XM2 headphones. The international version is in stock right now on Amazon in two different colors, and you can snag a pair for as little as $285. That’s a discount of more than $60! There were only 18 left in stock at that price at the time of this writing though, so they’re almost certainly going to sell out.